Long time, no review..If you read my blog regularly, you’d notice that the last product I reviewed was the argan oil by Organiclifeplus. Since then, it has been pictorials and other posts but no reviews. So, today’s post is a review. 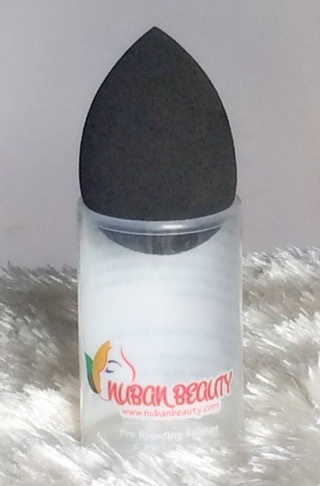 In my review of the Real Techniques(RT) complexion sponge, I mentioned that I was considering getting either the Nuban sponge/ the original beauty blender since I was a “tad” bit disappointed with the RT sponge(that “tad” has been increasing to “quite” and soon to “very”). 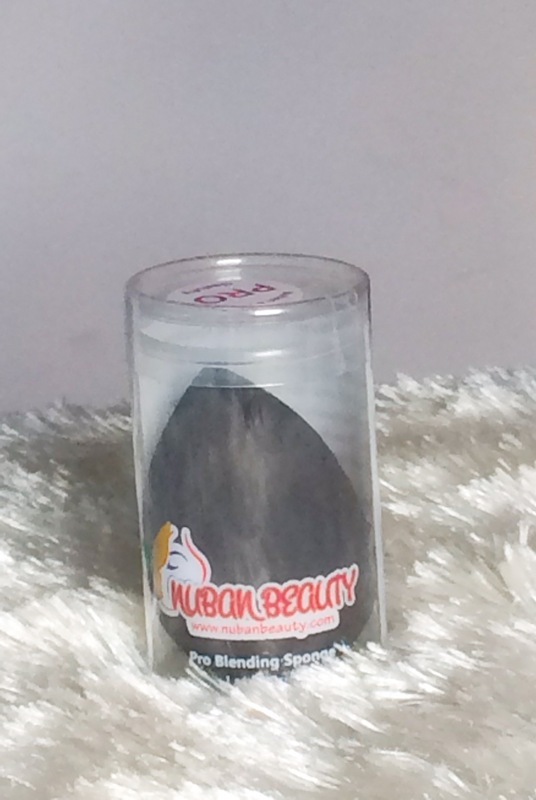 I decided to get the Nuban sponge because the hype around it amongst Nigerian makeup artists was intense(I can see why), it’s affordable and you know I love to #BuyNigerian. 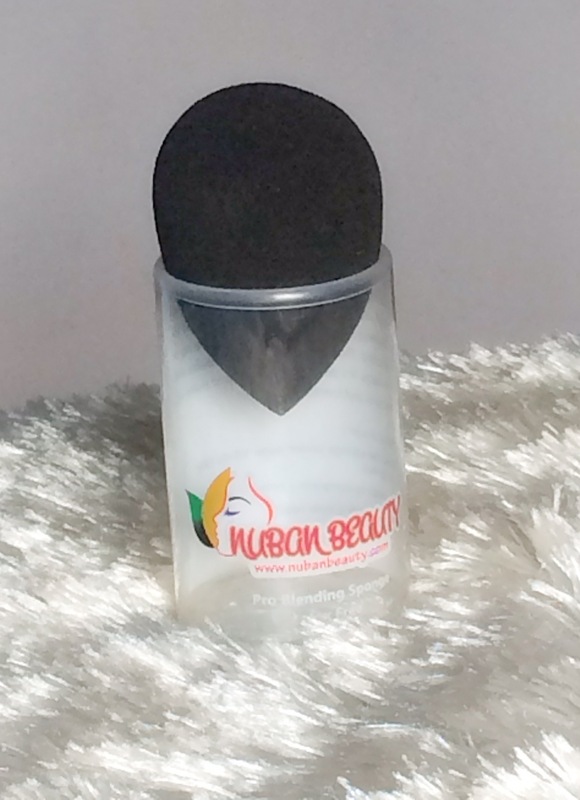 The Nuban Beauty Pro Beauty Blending Sponge gives you foolproof application to cover every inch of your face. The pointed end would get to the hard-to-reach spots; like the corners of your nose and around the eyes for covering imperfections. The large, rounded base blends the larger areas of the face for an undetectable finish. 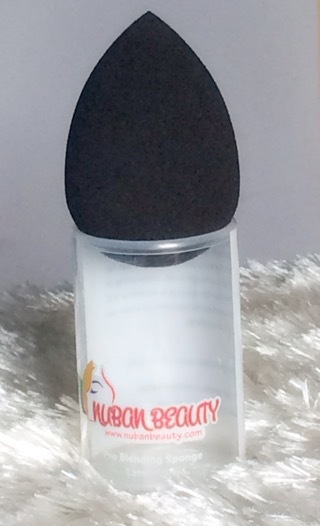 Nuban Beauty has 2 types of sponges; the Pro Beauty Blending sponge(which I am reviewing in this post) and the Pro Complexion Sponge(which is shaped similarly to the Real Techniques complexion sponge). 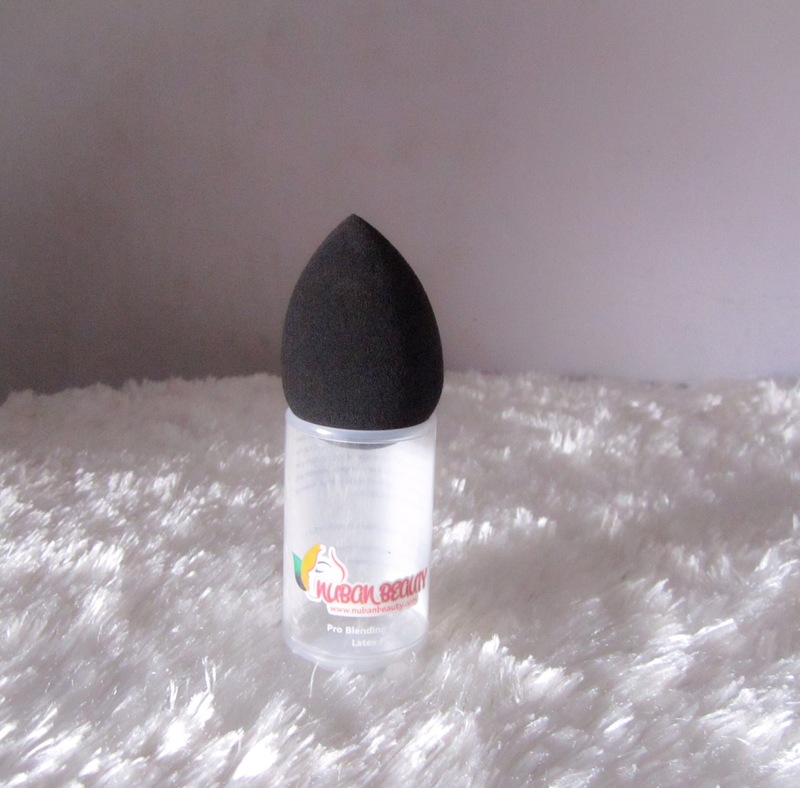 The Pro Blending sponge is the classic “egg-like beauty blender” shape, with one pointed end and the other round. The sponge I got was black in colour but they are other colours(baby pink, purple and pink). The rounded base is good for blending product all around the face while the pointed tip works for covering specific blemishes/spots and for reaching areas of the face that the larger rounded base cannot reach. This sponge blends perfectly! I use it damp and it blends out foundation seamlessly without leaving harsh lines. What I like most about this sponge is that unlike the RT sponge, it does not soak up product. This enables it to give you the best coverage when applying product. Once you dab on the product(either on your face/on the sponge), and blend it in, it’s blended. I really don’t know how else to explain this. Secondly, it’s easier to wash than any other sponges I’ve had. You basically apply the soap/cleanser you usually use on your wet sponge and squeeze out(Repeat a few times and this baby is clean). I can’t say about the durability because I’ve had it for about a week. I’d advise anyone to get it, both beginners and pros. I score it a 9 out of 10. What are your favourite beauty sponges? Or are you more of a “brush” girl?? Leave a comment below, let’s chat..
Hey girl! I recently picked up a random blending sponge by the brand revive from a local TJ Maxx and I seriously love it. I also bought one from a drugstore before this one and hated it. It was so stiff and felt like I was beating the crap out of myself. But my revive sponge is soooo soft and blends flawlessly. I haven’t used my ride or die foundation brush in over a week!!! Sponges are either a hit or miss…I’m so happy this is a hit! I’ll definitely check out your blog..
It’s a good sponge, you should try it out. 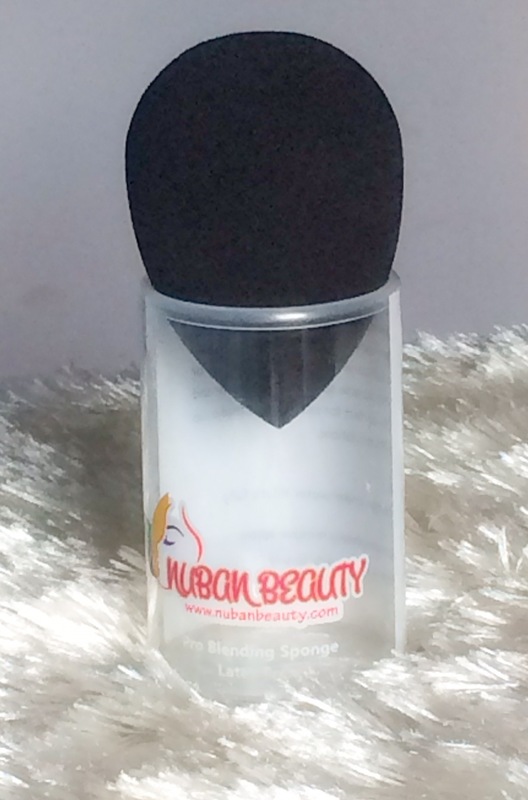 I’ve been a fan of the nuban beauty sponge. Even used 2 so far. I have the baby pink and purple. It lasts for a while. I think the first one lasted about 4-6 months or even more. But it’s a great buy. Very very good product. So soft and easy to work with. I’ve used the black and pink ones and the pink mini. It’s a great sponge…Best sponge I’ve used so far..